CLEMSON, S.C. (AP) — Clemson linebacker Isaiah Simmons accepts that many are concerned over the Tigers changing defense from its latest national championship. He’s not among them. It will take more than sheer will for the Tigers to play as strongly on defense as they did last season. Three of its draft eligible linemen — ends Clelin Ferrell and Austin Bryant and tackle Christian Wilkins — all passed up the NFL to return for a final college season in 2018. Ferrell and Wilkins were AP All-Americans this season, combining for 17 sacks and 34.5 stops behind the line. Also gone is tackle Dexter Lawrence, championship game MVP in cornerback Trayvon Mullen and linebackers Tre Lamar and Kendall Joseph. Many of those players will hear their names called at the NFL draft later this month. Clemson defensive coordinator Brent Venables acknowledged the oddness of not seeing those players on the practice field when workouts began in late February. Over the past five weeks, Venables has watched younger, less experienced players take ownership of the group — not shying away from the challenge of stepping into the voids left by their former teammates. “There’s a lot of things that give you a reasonable idea that we’re going to continue to make progress,” Venables said. Clemson’s defense was hampered this spring with injuries to a pair of projected starters in defensive tackles Nyles Pinckney and Jordan Williams . 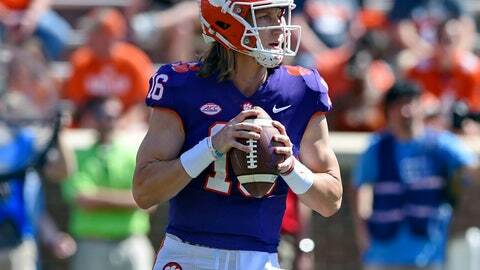 That’s given Venables to chance to rotate a host of young talented players like Logan Cash, Logan Rudolph, K.J. Henry, Tyler Davis, Justin Foster and Xavier Kelly into the mix. Expect most of Clemson’s opposing offensive coordinators to be most fearful of Xavier Thomas, a lightning quick, 6-2, 260 pound end who was the fourth best prospect coming into college last year per ESPN. Thomas played in all 15 games, his 43 tackles ranking 12th on the Tigers. Thomas’ flashiest moment came against Syracuse last September when he drove past the offensive line and took down quarterback Eric Dungey with a blind-side tackle that had the packed house at Death Valley gasping. He understands he’s got to build on his debut season for Clemson to maintain its defensive dominance. Thomas talks with last year’s starters often about his path forward. “I have to step in and be a leader now that they are gone,” Thomas said. Clemson’s past stars weren’t fully gone. Most returned to the spring game Saturday and were presented with championship rings for winning a fourth-straight Atlantic Conference crown and their second national title in three seasons. Their rings for the 44-16 victory over Alabama are emblazoned with the national title trophy and the words, “Best Ever” as the sport’s only 15-0 team in the modern era. Thomas had a sack while linebacker James Skalski two tackles behind the line of scrimmage, including a sack. Freshman Sheridan Jones had a pick-6 interception with time winding down Clemson’s White defense held Lawrence’s Orange offense to fewer than 300 yards in White’s 30-10 victory. Linebacker Shaq Smith was happy to see his old teammates return. But the Tigers have turned the page on last year. “We don’t want to dwell on the past,” he said.